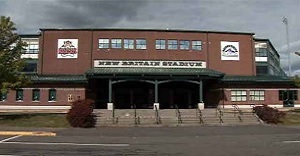 The nickname of the Atlantic League's newest team in New Britain will not be known for another week (October 30), but the league should be overjoyed with the support that is pouring out of the Connecticut community. When the mayor (Erin Stewart), the hometown newspaper publisher (Michael Schroeder, New Britain Herald) and more than 1,000 fan nominations throw their attention into the hat with suggestions and the newspaper tosses in significant promotion of the naming process it is a pretty good indication of the support the new team will receive after many years of having a major league-affiliated Class AA farm club. The five nickname finalists were revealed Thursday. They are Stingers, Hornets, Hard Hitters, Hammer and Bees. It may have even been an understatement when Atlantic League Founder Frank Boulton said "much of the (league's) success" in its first 18 years can be traced to the only executive director the circuit has known. Joe Klein gave the Atlantic League virtually instant credibility since he had been general manager of three major league teams, then he tirelessly worked to help the major leagues understand the new league and to bring quality players into the league, then to get them new opportunities when such was warranted. The league is honoring him annually with the Joe Klein Atlantic League Executive of the Year award, with the first honoree Pat Day, president and general manager of the Southern Maryland Blue Crabs. Jarrett Grube (Southern Maryland) gives the Atlantic League an alum playing with USA Baseball in the initial WSBC Premier12 tournament in Taiwan and Japan November 9-21. The team is made up of players not currently on 40-man major league rosters. Grube, who turns 34 on November 5, was 9-0, 2.26 with Cleveland's top farm club (Columbus) and 4-4 in Mexico this season. Infielder Ildemaro Vargas (Bridgeport) and right-hander Nick Sarianides (Southern Maryland) have been rewarded with new contracts in the Arizona farm system. Vargas, 24, hit .321 in 86 games in the Midwest League this season while the 26-year-old Sarianides struck out 91 California League hitters in only 55.1 innings. He gave up a stingy 37 hits in his 54 appearances while saving 28 games and winning once (1-4, 2.11) at Visalia.